If you expect that users will be conflicted about the product or service you offer, provide them with many reasons they can use to prevent cognitive dissonance and keep their pride intact. 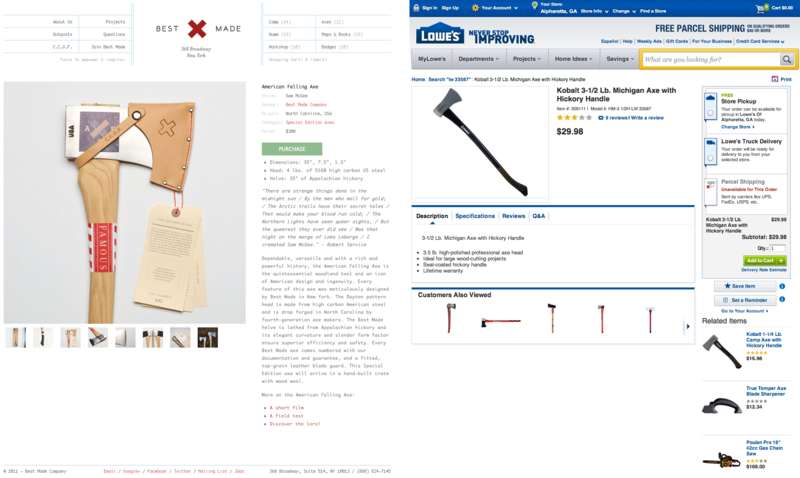 Best Made and Lowes both sell hickory handled axes. Best Made’s is ten times the price of Lowes’ but that’s probably OK with Best Made’s clientele, because Best Made gives them all the reasons they need to purchase: it’s a work of art, it’s part of a hipster lifestyle, it’s been exhibited in London by the Saatchi gallery. Buyer’s remorse occurs when a purchaser struggles to justify the high purchase price and their desire for an item in comparison to their subsequent feelings of the item’s worth. Sites help customers resolve this cognitive dissonance by giving them reasons and evidence that bolster their satisfaction with the product (positive reviews, images of famous people using the product, and promises of hard-to-quantify benefits such as social approval brought about by using the product) rather than letting them resolve the dissonance by returning the product. Give purchasers plenty of reasons to want your product. Provide testimonials, reviews, and lifestyle images. Help them visualize a rosy future that includes your product. This is just as important after the purchase as before. Don’t have a glossy sales page and a dull support page. Make it clear to existing owners that they did the right thing. Add something cheap but unique to your product offering. Best Made place their axe in a wooden crate lined with “wood wool” (shavings). This costs them comparatively little but boosts the appeal of the product by giving owners self-reassuring evidence that they received something special. Hire good product packaging and site designers. Presentation—how the product looks—can determine its price point. Utilitarian or bohemian?